I must admit that I was surprised in a way on how the story of Megamind (Dreamworks) would appear of the big screen. The trailers and teasers would be enough to entice you to watch but it’s such a revelation on how the story progressed and ends. This is one movie that has it’s own twists and turns which keep you in tuned and glued to your seat. The actors and their voices were perfectly cast for this movie. The voices are very distinct and it’s easily recognizable. Will Ferrel as Megamind, Tina Fey as Roxanne Ritchie, David Cross as Minion (a cute character I must say), Johan Hill as Hal Stewart and Tighten, Brad Pitt as Metro Man, and Ben Stiller as Bernard. It’s not only a delight on how the actors do complement the characters but the storyline is very amusing and it will keep you guessing until it unfolds itself in the end. 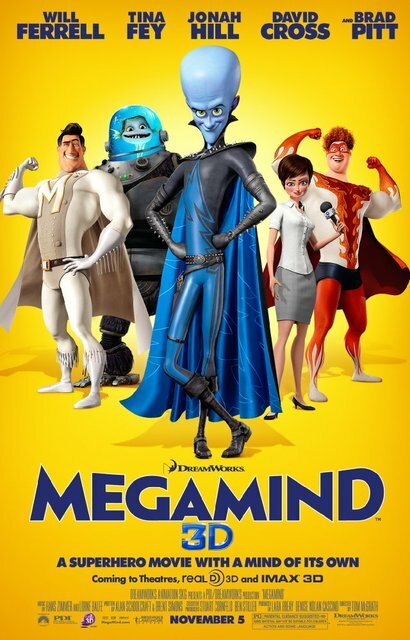 Megamind’s character, as a super villain, is something that will grow on you. It leaves me in awe and wanting to get a stuff toy for myself. For a villain, I rarely find them amusing (who does?) but the way his character was formed and explained, it all made sense why he is that way and the more you get to know him, the more you not only understand but somehow appreciate him as well. Lastly, this is one movie that although offers 3D version of the movie, it certainly didn’t add great value for money. I watched it in regular 2D format and it’s awesome all by itself without paying double for something that you have to wear the whole entire movie. Sometimes, it makes me wonder and question what movies are best suited for the 3D format. A very highly recommended movie for the whole family with very valuable lessons that some evil has the potential to be good after all. For those who watched it, you know what I’m talking about and for those who haven’t — what the hell are you waiting for?